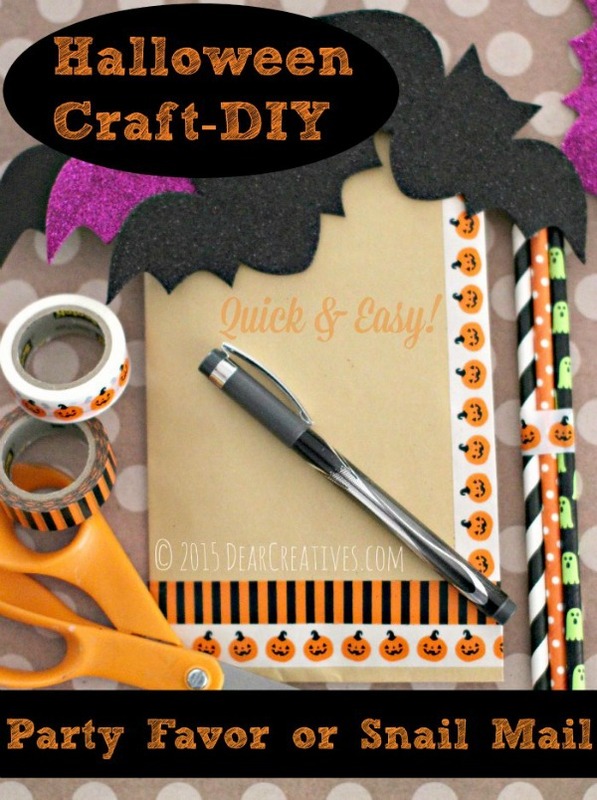 These quick and easy Halloween DIY projects are prefect for me. They are easy to make and inexpensive on supplies. What’s not to like? This is such a busy time of the year. And the expenses associated with the upcoming holidays means that I don’t want to spend a lot of either money or time on my decorating for such a short holiday like Halloween. It seems to be over in a flash and then it’s on to Thanksgiving and Christmas. 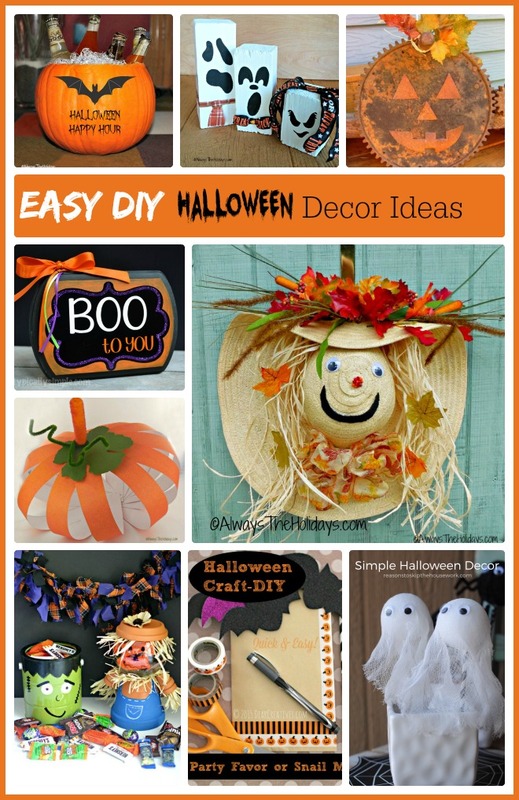 These quick and easy Halloween DIY projects will add some seasonal decor to your home but won’t break either the time or the money bank. Got a pumpkin? Turn it into a drink holder. Just scoop out the flesh and seeds (save them for later) and line it with a Dollar Store plastic blow and fill with ice. 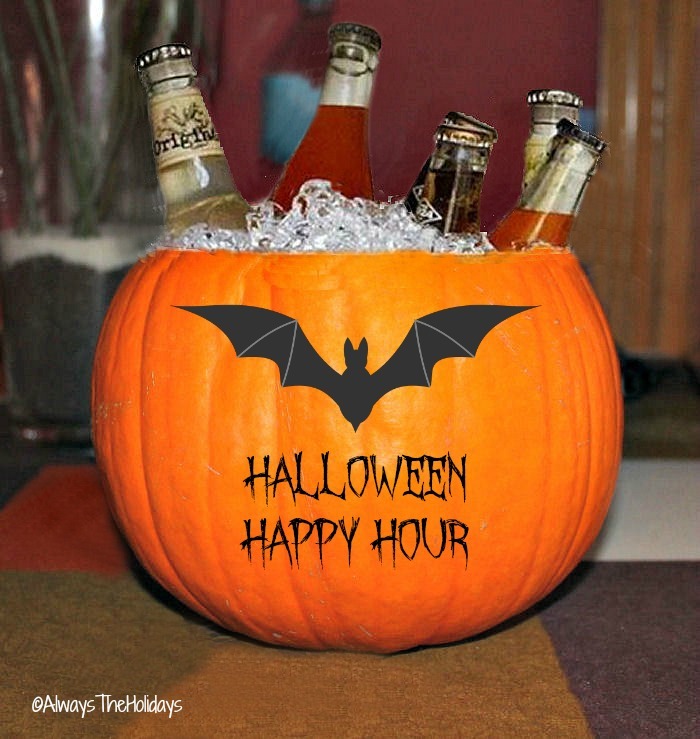 Perfect ice bucket for a Halloween party! 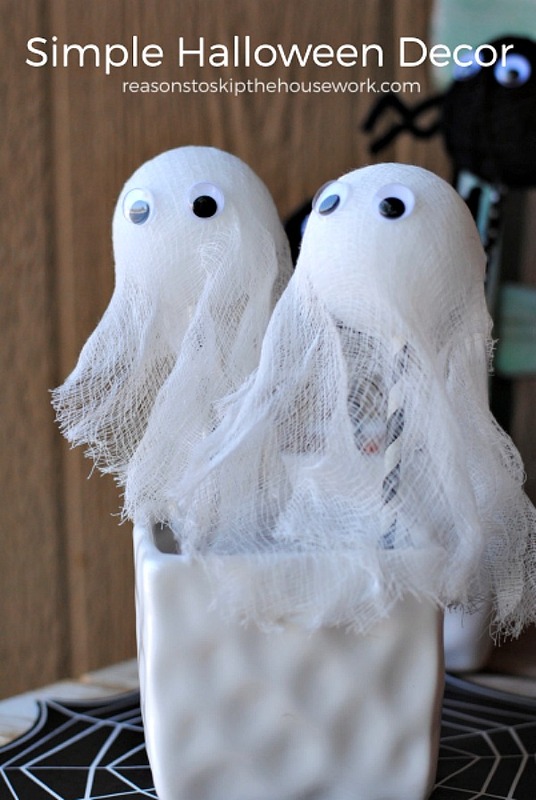 How cute are these Halloween table decorations. They are made from an old paint can and some plant pots. Get the tutorials at This Girl’s Life Blog. These cute Halloween ghost cost me practically nothing. I used an old mail box post, and painted the faces. A Dollar store ribbon left over from another project added the details. See the tutorial here. This is such a simple project but I love the way it looks on a table. 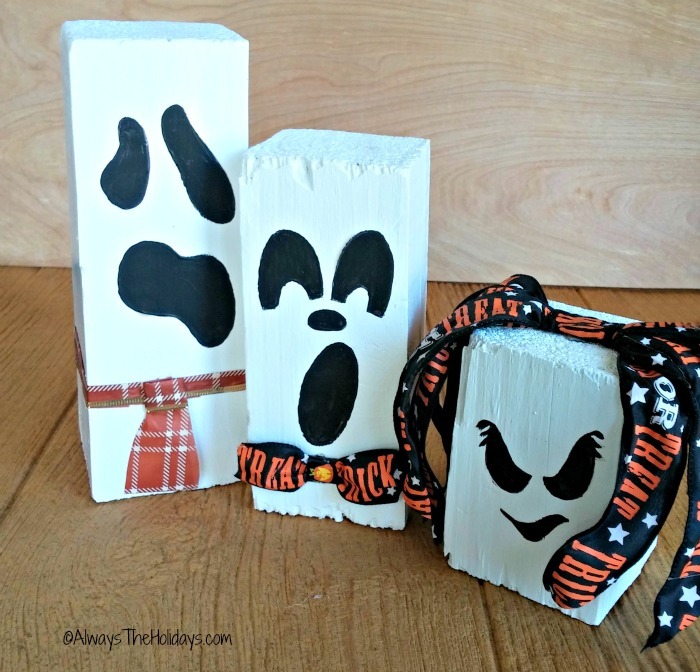 Get the tutorial for this foam ghost project on Reasons to Skip The Housework. 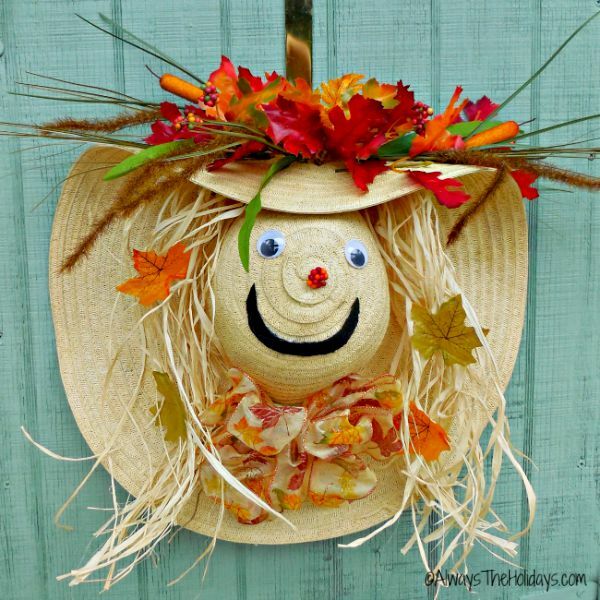 This cute scarecrow door decoration adds a lot of curb appeal to my front entry. I made this adorable guy from an old garden hat that had a hole in it and a few inexpensive craft supplies. See how I did the project here. 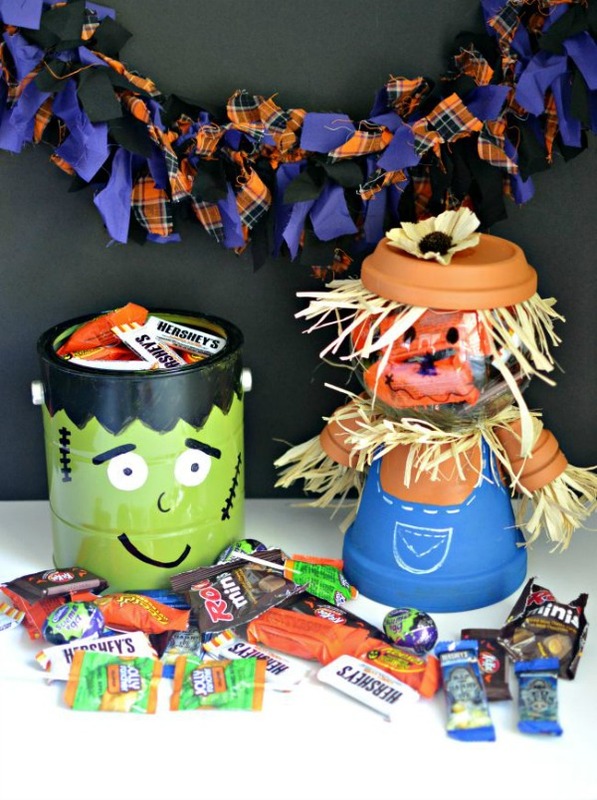 These cute Halloween party bags require just a few supplies and are easy to put together. The local trick or treaters will love them. See how to do them on Dear Creatives. My friend Carlene from Organized clutter does the best junk craft projects. 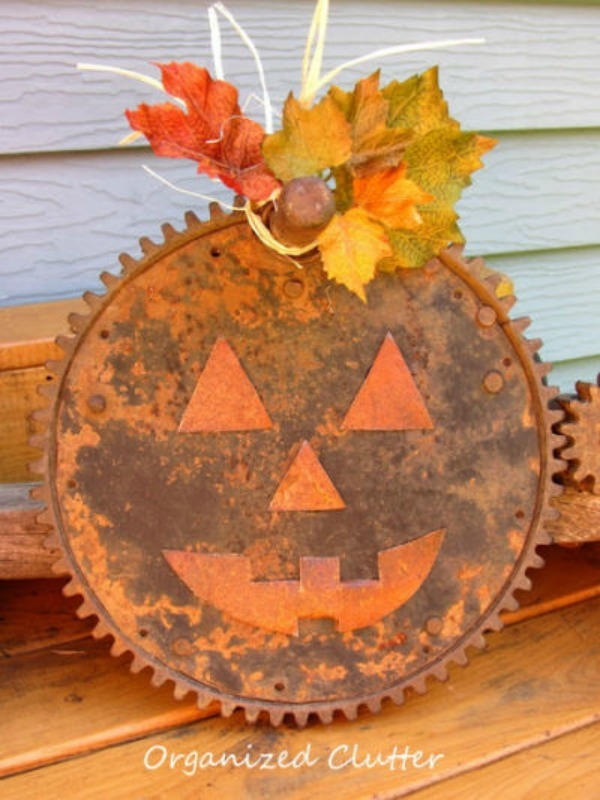 This one features a rusty old gear. See her tutorial here. 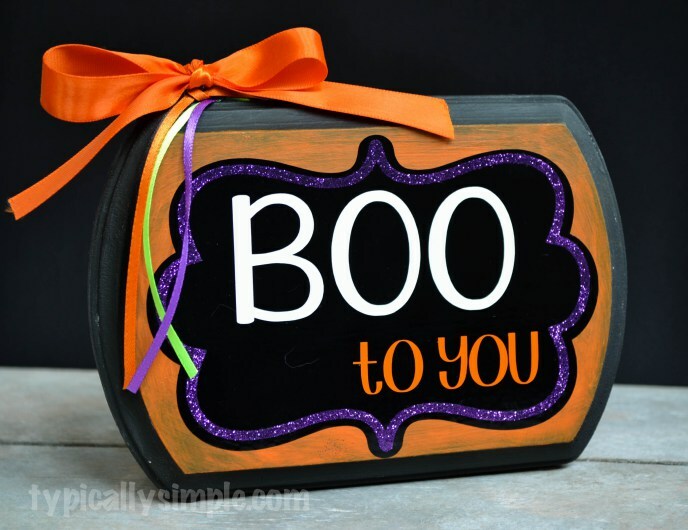 This Boo to you Wood Sign project takes a bit more time to do but is so cute. You can see the tutorial at Typically Simple. 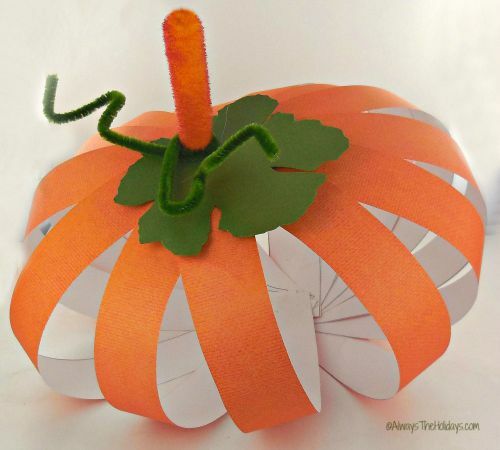 If you have some scrap paper and a bit of felt, you can make these scrap book paper pumpkins. So easy to do and you can use whatever color you like. See how to do them here. Do you still need some more inspiration? Try one of these inexpensive ideas. 1. Slithering Snake Door Mat. 2. Scaredy Cat Halloween Tablecloth. 3. How to decoupage a Pumpkin. 4. Spiderweb Trick or Treat Boxes. 5. No carve Vampire Pumpkin. 6. Spooky House O Lantern. 8. Black cat and Mouse Pumpkin Painting. 11. Pumpkin Pillow Made from a Placemat. Do you decorate for Halloween? What is your favorite DIY project?